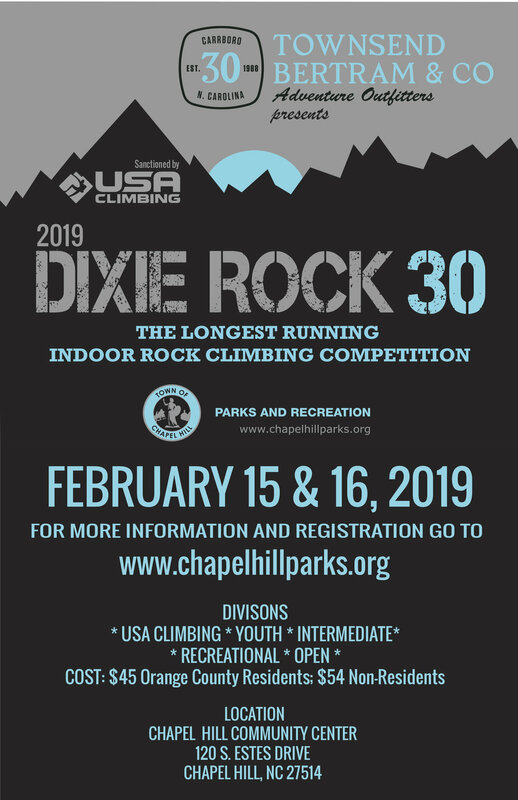 Townsend Bertram & Company presents Dixie Rock 30, the longest-running indoor climbing competition in the United States in partnership with Chapel Hill Parks and Recreation. This year we are celebrating 30 years with a little friendly competition at this fun for all ages climbing event. For more information and registration, check out the Dixie Rock page through Parks & Recreation. Climbing divisions include Youth, Intermediate, Recreational, Open, USA Climbing Members. (Prizes awarded for both Male and Female winners in each category). Crush with your friends! All ages and ability levels are welcome. Preliminary climbs held Friday night and Saturday afternoon for the Community. USA Climbing members will be Saturday morning. Register for the DIXIE ROCK 30 Climbing Competition presented by TB&C and stanchioned by USA Climbing. Do it before FEB 1, 2019 and get a free Dixie Rock 30 T shirt with SWAG bag. T-shirts also available for purchase at the event while supplies last. Standard Red Dot points, climb as many routes as you would like (3 attempts per route) to get as many points as you can. We have amazing prizes from Helinox, Melolius, Arc’teryx, Black Diamond, Buff, Crazy Creek, Good-to-Go, Hydrapak, Petzl, Rab, Topo Designs, Prana, Danner, Kavu, Free Fly, Patagonia Provisions, Mountain Khakis, Bison, Pistil, Hydroflask, Howler Brothers, Fjall Raven, Sherpa, ENO, Cotopaxi, Sierra Designs, United By Blue, The Landmark Project, Meridian Line, Smartwool, Patagonia, Osprey, Oboz, Keen, Royal Robbins, Blundstone, Merrell, Danner, Chaco, Kuhl and more. A huge thanks to all the brands listed above and everyone who has helped make this event possible.